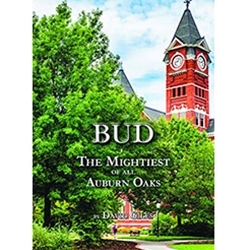 Bud covers the life and times of Bud, the mightiest of the Auburn Oaks[[ offspring. Through a series of near tragicevents, Bud has proven that he is a survivor and is the true embodiment of the Auburn Family spirit. This heartwarming and sometimes humorous tale will fill you with pride and tickle your funny bone. From Bud being decapitated by a bomb squad to being run over by an Alabama fan, you will certainly be entertained.Best of all, 100% of the profits from this book go to Auburn University, specifically to the Auburn Oaks Dean's Endowed Fund for Excellence in the School of Forestry and Wildlife Sciences. That is, 100% minus $1.00 per year so David can tell people he is a successful author.